Flowers colour change from lime green through to white then fade to green again. Hardy down to -20C - growing up to approximately 1.2m tall. AKA 'Strong Annabelle' as it has been bred with superstrong stems to support the amazing giant blooms. Supplied as an extablished plant, pruned back, in a 3L pot , Note - dormant in winter so has no leaves until April. 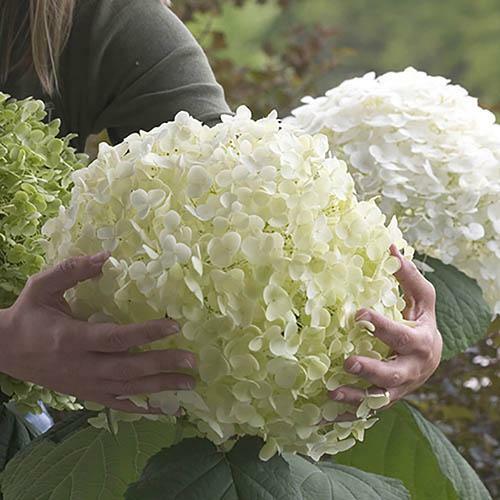 Hydrangea 'Incrediball’, the Tree Hydrangea (also known as Strong Annabelle), produces amazing and enormous colour-changing blooms that change from Lime Green to Pure White then fade to Green again, to make the most amazing displays in your garden and your home. It is unbelievable, but true! This is an entirely different species and variety than the traditional pink and blue plants you are probably more familiar with. The stems are incredibly strong to enable the support for this amazing flower, and they are tolerant of rain and wind hence the name, 'Incrediball'!! Also known as 'Strong Annabelle', this has been bred to supersede Hydrangea 'Annabelle', which suffered from weaker stems in wind and rain. Displays will be all summer long whatever the weather and will produce flowers to up to 30cm or 12 inches in diameter. They can be cut and used as dried flowers too - this will preserve the natural colouration or spray them gold or silver for spectacular Christmas decorations. The Tree hydrangea is a form of Hydrangea that is quick-growing, forming an upright shrub. Unlike the bushy hydrangeas, these shrubs provide later blooms for added garden colour. Growing as a shrub with multiple stems, tree hydrangeas can be pruned to look like trees, hence their name. Supplied as an established plant in a 3L pot, for real Summer impact in your garden, the Tree Hydrangea 'Incrediball' is a winner. Supplied as an established plant in a 3L pot, pruned back, with several branches, ready to plant straight into the garden or into pots. Dormant in winter until early April. Do not allow to dry out in breezy Summer days.